Sephora has a new promo offer out now! 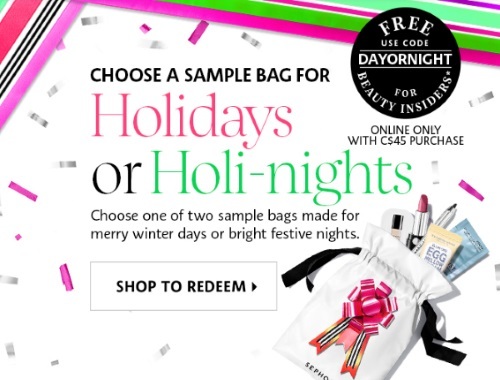 Get a Free Holiday or Holi-nights Sample bag with any online purchase of $45 or more. Choose one of two sample bags made for merry winter days or bright festive nights. Enter the promo code DAYORNIGHT at checkout to add this free gift to your cart. Available while quantities last for Beauty Insiders (free rewards program that you can join).